India’s External Affairs Minister Sushma Swaraj on Saturday offered to open an Information Technology Park in Sri Lanka that could attract investments in this growing sector. 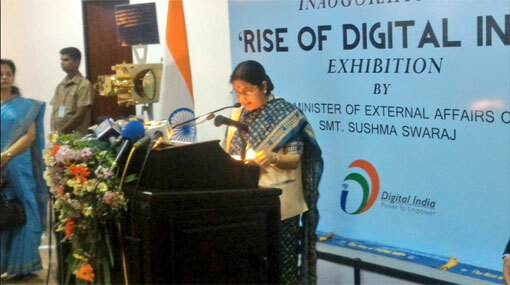 She made the remarks while inaugurating an exhibition on the ‘Rise of Digital India Exhibition in Colombo’ as part of the first festival of India in Sri Lanka, which is aptly titled, ‘Sangam: a confluence of cultures’. “We are ready to set up an Information Technology Park in Sri Lanka that could attract investments in this important sector, and both sides agreed to explore this issue further,” Swaraj said. “I am aware that Sri Lanka too, has been focusing on promoting information and communication technologies for socio-economic development, and has achieved notable success in various fields,” she told the gathering. Swaraj said in her interactions with top Lankan leadership, she found that Sri Lanka is keen on developing the IT sector as part of their effort of developing their service sector. “One of the issues that I discussed with Minister Mangala Samaraweera was the importance of information technology for the development of both countries, and to take advantage of the opportunities that the new digital world offers. We felt that there are enormous opportunities for cooperation between the two countries in the field of information and digital technologies,” said Swaraj, who is in Sri Lanka on a two-day visit. She said Prime Minister Narendra Modi has placed ‘Digital India’ at the heart of the nation’s development strategy and the ‘Digital India’ initiative is one of the key measures to make government transparent, responsive and citizen-friendly. “The objective is to create a digitally empowered society and infuse technology into government, healthcare and education. Our Prime Minister has often spoken of his vision of a Digital India, wherein technology ensures that the Citizen-Government Interface is incorruptible and where the netizen is an empowered citizen,” she said. The exhibition showcases the phenomenal rise of digital technologies in India, and the use of computing and application of these digital technologies in a manner which has positively impacted the lives of millions of Indians in every area of contemporary relevance such as agriculture, power generation, weather forecasting, e-commerce, atomic energy, space, communication and e-governance. Swaraj said this exhibition is just a small glimpse of the vast strides that have already been made by India in the last century. “We are ready to share our competencies with our Sri Lankan brothers and sisters. It gives me immense pleasure to welcome our Sri Lankan friends to view this exhibition,” she said. Earlier on Saturday, Swaraj met President Maithripala Sirisena, former President Chandrika Kumartunga Bhandaranayake, leaders of Tamil National Alliance and Sri Lanka Muslim Congress.